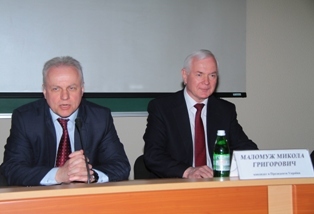 May 8 in Zaporizhzhya National University was held a meeting of teachers and students with a candidate for President of Ukraine, famous politician, former Chairman of the Foreign Intelligence Service of Ukraine, Ukraine Army General (in stock) Mykola Malomuzh. 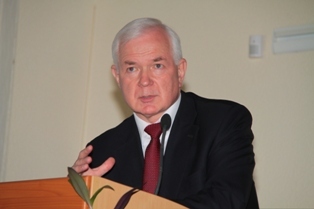 At the time, Mykola Malomuzh was Deputy Chairman of the State Committee of Ukraine on Nationalities and Religions of Ukraine and the Army General Advisor to the President of Ukraine (from 11 October 2010 to 24 February 2014). Opening the meeting, the Rector of ZNU Mykola Frolov introduced the guest to all those present of the event and asked him to perform. 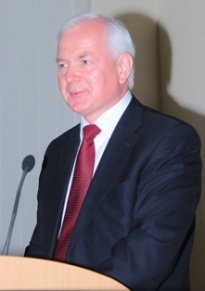 Candidate for President of Ukraine Mykola Malomuzh presented his election program and stopped on its main points. Under the program of Mykola Malomuzh top priority today is to preserve the territorial integrity of Ukraine, ensuring the inviolability of its borders, a system of international safeguards and legal security. Also a candidate for President of Ukraine plans to improve social welfare by due to bridging the gap between rich and poor, to work for the prevention of destructive social conflicts start the fight against crime and corruption. The basis of the national economic complex, according to his election program, will become a new economic course that the transition to investment and innovation progressive growth model. He believes that Ukraine's economy needs high value-added and expensive labor. Also under the program of Mykola Malomuzh it's time to build the conditions for stimulating sustainable protect and promote the interests of small and medium-sized businesses, reducing administrative and tax burden on the subjects of business initiatives fierce counter raiding. Mykola Malomuzh believes that Ukraine needs to harmonize humanitarian sphere, the development of local government, a new model of governance, separation of powers, and business optimization bureaucracy, transparent system of e-governance. It stands for constitutional and judicial reforms, fighting corruption, ensuring social security, the economy out of the shadows and refund settled in foreign accounts through criminal schemes. 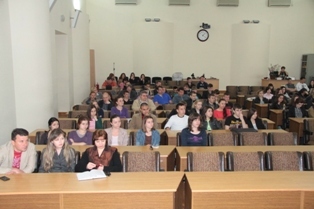 In addition, communicating with collective of ZNU, candidate spoke about the situation in Ukraine today, and answered the questions that interested the audience.